Like many other 19th century communities, Sandusky was not immune to epidemics of contagious diseases that occurred during this era. Unsanitary conditions were common in cities and other urban areas due to both a lack of sewer systems and limited access to pure clean water. The worst of these contagious disease outbreaks to hit Sandusky was the Cholera epidemics that occurred between 1849 and 1854. The city’s worst Cholera outbreak occurred during 1849, when Sandusky was home to approximately 4,000-6,000 residents. On June 25, 1849, an extremely ill man named Shepard and a German immigrant woman were reported to have arrived in Sandusky by train. Although the man later was able to recover, the women became violently ill and died only three days after arriving in the city. During the next two months many more cases of Cholera were diagnosed and about 400 people died of the disease. The 1849 cholera outbreak caused a panic in the city with many people choosing to leave the area, which left Sandusky’s streets virtually deserted. Doctors and nurses traveled from not only neighboring communities but also from Cleveland and Cincinnati to assist in helping the ill. Many of them worked out of a makeshift hospital that was located in a primitive building in what is now the downtown courthouse square. Three more Cholera epidemics would strike Sandusky in 1850, 1852, and 1854, but in all three cases the loss of life was far less severe then what was experienced during the 1849 outbreak. Only during the 1852 Cholera epidemic was a hospital again opened to treat the roughly 90 cases that were reported, with 30 of those people losing their lives as a result of the disease. 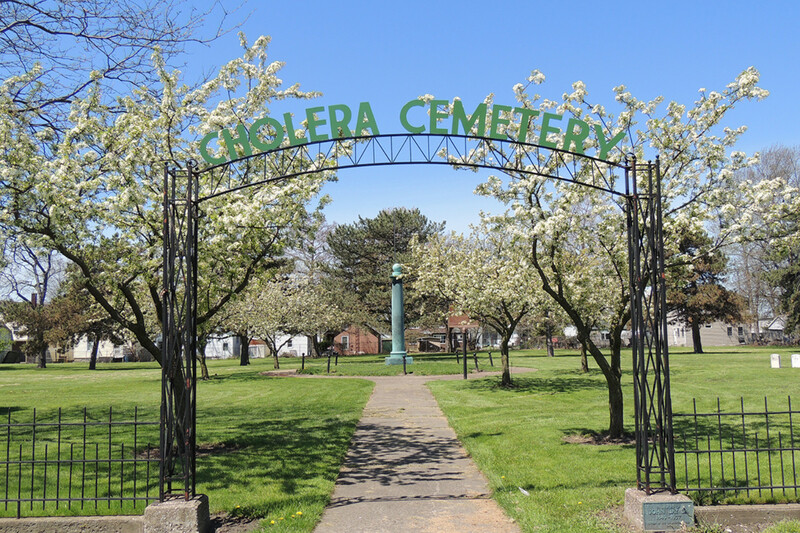 As was also true in many other communities, the Cholera outbreaks led to increasing calls for the City of Sandusky to develop and construct both a water and sanitary sewer system, which it did beginning in 1874. Due to the large number of deaths from the outbreak, many victims were buried in mass graves in the city’s old Harrison Street cemetery, which is now known as the Cholera Cemetery. This cemetery was closed a year after the 1849 epidemic when Sandusky’s Oakland Cemetery was opened in Perkins Township. In later years the old Harrison Street Cemetery was left virtually abandoned and forgotten with many of its tombstones either being lost or stolen. In 1924, in an effort to recognize both the significance of the epidemic and to honor those whose lives were lost, the old Harrison Street cemetery was restored. A central feature of this restoration was the installation of the large bronze monument located at the center of the site. John W. Lay, whose family was well-known for its operation of a local fisheries business and whose father is buried in the cemetery, was a major contributor to its construction. The monument itself was built by the Sandusky Foundry and Machine Company, which continues to operate today only a few blocks from the site as MetalTek International.